Intensive Crop Production is increasing with the need to optimise the utilisation of natural resources due to growing economic and environmental pressures. In addition, consumers are no longer expecting but demanding safe, fresh, quality produce. Hydroponic crop production using Galuku Cocopeat growing media offers the opportunity to consistently maximise yield and quality with minimal environmental impact associated with utilisation of this renewable resource. Galuku Cocopeat is a superior grade of coir fibre manufactured from the processing of coconut husks. The shorter fibres of coir pith (typically 5mm or less) are used as a direct growing medium and replacement for the disturbance of naturally occurring peat wetland ecosystems. During processing, a stringent quality management program is adhered to ensuring Galuku Cocopeat is consistently produced to a set of Quality Standards. Galuku Cocopeat is currently available in Galuku Cocopeat Growbags, Galuku Cocopeat 25 kg Bales, 5 kg Blocks/Briquettes/8 cm Discs. All Galuku Cocopeat products are biodegradable (with the exception of packaging) and can be used as the sole growing media throughout crop production or blended with other products to modify the properties to suit individual applications. Galuku Cocopeat Growbags are supplied dry and wrapped in UV stabilised 'panda' plastic. Galuku Cocopeat Growbags are rigid and easy to handle. Upon saturation, the dimensions of Galuku Cocopeat Growbags are 1100 mm x 125 mm x 200 mm displacing a typical volume of 27.0 L.
Galuku Cocopeat is durable due to the lignin and cellulose content and disease free when packaged. The air-filled porosity is typically 15 to 20 % and water holding capacity is typically 65 to 70% when measured to AS 3743-1996 for Potting Mixes as representative of Galuku Cocopeat Growbags when in use. Galuku Cocopeat possesses cation exchange capacity, nutrient buffering, is slightly acidic, non saline and demonstrate capillary action with high readily available water content. Galuku Cocopeat is biodegradable, environmentally friendly and a naturally renewable product. Typical Quality Standards are available upon request from Galuku Pty Ltd outlining the chemical and physical properties, phytosanitatory certification and MSDS. Galuku Cocopeat Growbags are rigid, light weight and can reduce labour costs in preparation, planting, crop culture and disposal. The white plastic wrapping, negates the need for pots, reduces evaporation from the Galuku Cocopeat Growbags and the risk of disease contamination. Galuku Cocopeat Growbags do not require rigid support in leveled surfaces. The presence of organic compounds in Galuku Cocopeat can stimulate root growth and offer some natural resistance to plant disease. The high water holding capacity provides a buffer in high temperatures and high crop load demand without compromising air supply. Aeration can be manipulated by altering moisture content via irrigation frequency and volume, increasing the height of the Galuku Cocopeat Growbags or planting depth for certain crops via starter blocks. With these tools it is impossible to over water sensitive crops such as Gerberas and Cucumbers. Provided careful hygiene and crop management is practiced, Galuku Cocopeat Growbags can be used for successive production cycles with short term crops. Galuku Cocopeat Growbags have been used for a wide range of hydroponic crop production throughout the world including: tomato, cucumber, egg plant, capsicum, zucchini, strawberry, melons, carnation, rose, gerbera, gypsophila, lisianthus, chrysanthemum etc. Galuku Cocopeat Growbags serve as an organic alternative to Rockwool and Perlite media without the environmental disposal issues. A reliable supply of good quality water is essential for successful crop production. It is advised to have your water source analysed for chemical, physical and biological properties prior to use to assess the suitability and or special management conditions. Surface water supplies should be disinfected prior to use and it is advised to seek specialist advice to optimise performance of the production system. As for any crop production, careful hygiene should be practiced to minimise the risk of disease infection and potential loss in yield and quality. The recommended crop layout will depend upon the crop to be grown, the average plant density required to suit the production system, irrigation system and the environmental conditions. The Galuku Cocopeat Growbags can be laid out on a flat surface or with a maximum advised slope of 55 mm in 1100 mm or 1:20. In either case, any drainage water generated should not be allowed to enter any of the Galuku Cocopeat Growbags, with drainage promptly removed from the area and disposed of in an appropriate manner. The Galuku Cocopeat Growbags must not come into contact with the soil or any other material with disease potential. After the Galuku Cocopeat Growbags have been laid out in a suitable arrangement, drainage and hygiene have been addressed, the Galuku Cocopeat Growbags can be prepared for crop production. 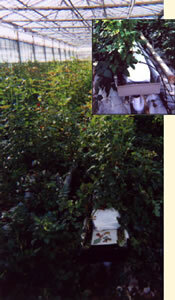 Cut or preferably burn holes in the top plastic wrapping where plants are to be planted. Minimise the size of planting holes as this will reduce evaporation rate from the Galuku Cocopeat Growbags and allow several plantings in the vicinity of previous plantings. Planting holes can be offset (diagonally opposed) or aligned to suit individual crops. The amount of planting holes will vary depending on the crop but as a guide, 4 tomatoes for inexperienced growers and up to 5 tomatoes for experienced growers can be planted per Galuku Cocopeat Growbag. 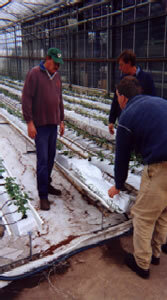 A typical spacing of 150 or 125 mm from the end of the bags and 270 or 210 mm between the centre plants is used for 4 to 5 tomato plants per Galuku Cocopeat Growbag respectively. After planting holes have been made in the Galuku Cocopeat Growbags, place a dripper (minimum of 1 dripper per plant) in the centre of the planting hole. Saturate the Galuku Cocopeat Growbag with a suitable nutrient solution containing a non ionic wetting agent at manufacturers recommended rates to improve lateral movement of the solution. As a guide, you may need to add 15 to 20 L of nutrient solution to saturate the Galuku Cocopeat Growbags. 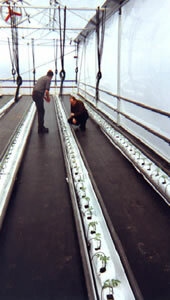 Allow the Cocopeat to absorb the solution for 24 to 48 hours, then place horizontal drainage slits 10 to 15 mm from the base and 25 to 40 mm in length midway between the planting holes/drippers. A single drainage hole between the plants positioned diagonally along the Galuku Cocopeat Growbags will help facilitate uniform blending and drainage of nutrient solution from the Galuku Cocopeat Growbags. By example, for 4 tomato plants per Galuku Cocopeat Growbag, a minimum of 5 drainage slits are advised with 2 and 3 drainage slits per opposing side to form diagonally opposed slits. Continue to irrigate the Galuku Cocopeat Growbags with nutrient solution to generate run off and measure the pH and EC of resultant run off. Plant the crops once the EC of the run off is at the required level and manage the crop according to requirements. Other than specific management and control of the rootzone environment with the Galuku Cocopeat Growbags, crop management is the same for other production systems growing the same crop, ie crop protection, pruning, staking, harvesting, environmental requirements etc. Liquid feed the plants regularly using a suitable nutrient solution to suit the crop, phase of growth, environmental conditions, crop performance, fruit load, varietal requirements etc. In general, run off from the bags should be measured for pH and EC and recorded daily and management altered to optimise crop potential. Aim to consistently generate a minimum of 15 to 20 % run off from the Galuku Cocopeat Growbags. Maintain the nutrient solution volume within the Galuku Cocopeat Growbags to provide optimal buffer and regulation of pH, EC and nutrient composition within the rootzone. Always use liquid feed but vary the feed strength, frequency of irrigation and volume used to suit the plant and environmental conditions. In hot weather, high light conditions, weak or highly generative growth use a lower conductivity and feed more frequently whereas with low light, cool weather, soft growth use a higher conductivity and feed less often. The only modification to standard nutrient formulations for Cocopeat is to increase calcium by 10 to 20 % in the initial 4 weeks from commencement of crops. In all cases, run off solution and leaf analysis should be conducted on a regular basis to determine optimal nutritional management of the plants and the assistance of a qualified consultant to optimise productivity. Provided the Galuku Cocopeat Growbags have been free of disease they can be reused several times for short term hardy crops such as tomatoes, cucumbers, egg plant and capsicum. For crops highly susceptible to aerial disease such as Fusarium sp. it is preferred to discard the Galuku Cocopeat Growbags or plant out to a non susceptible crop.